Espa Optimatic 05 Automatic Controller - Adjustable Starting Pressure. Adjustable starting pressure between 1.5 & 3 Bar. 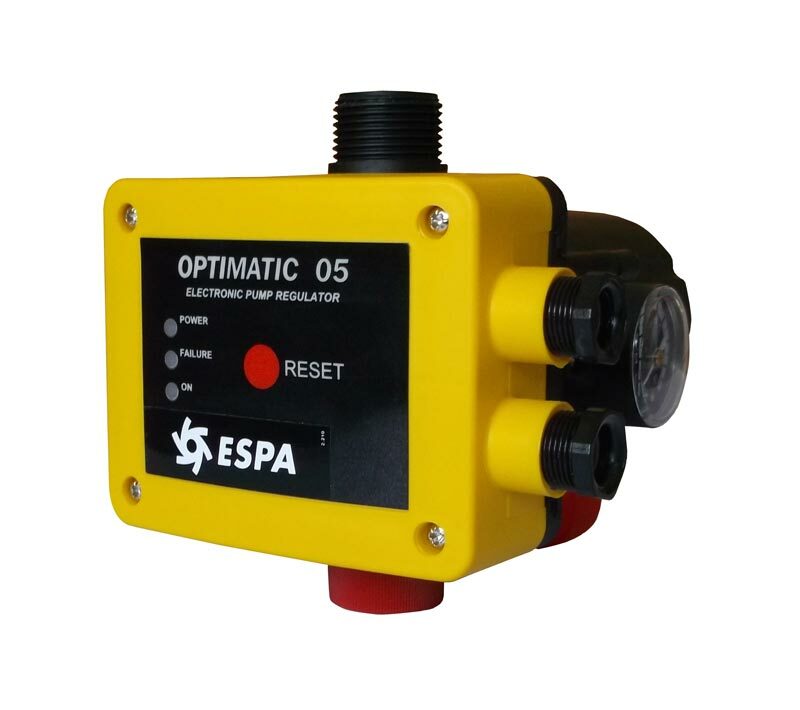 The OPTIMATIC 05 is a compact device for the Automation control and protection of water pumps. This system includes special electronic sensors of flow and pressure integrated in the electronic circuit, which controls the correct operation of the electric pump and keeps the pressure and the flow constant. Moreover, it has a safety system against dry-running. The OPTIMATIC 05 replaces the traditional expansion tank, pressure switch, retention valve and level switches, with the advantage of smaller dimensions and the elimination of periodical maintenance. It operates starting automatically the electrical pump when any point of the installation is opened and it stops the pump, after 10 seconds of temporization or when the using point (tap/valve) is closed. The device can be directly connected to a single phase pump up to 1.5kw (2 HP) or to a more powerful pump, using an auxiliary. ESPA Optimatic 05 Data Sheet.